BCP SKU: SKY2372. Light up the room with this classy Tiffany-style floor lamp. Classic 60-watt light bulb adds warm light to the room. Lamp: 62"(H). Base: 11"(L) x 11"(W) x 62"(H). Assembly required (with hardware and instructions). Your lamp should not be sprinkled with water or left outdoors. To dust your salt lamp, simply wipe with a damp cloth. Color, shape, size and weight may vary. USB adaptor not included. This is a used lamp. The lamp is 8.5" tall from base to wing tip and 5.5" wingspan at the widest point near the top. The wings are made of beautiful Tiffany style striated and stained glass and cabochons held securely together with tin coated copper, not lead. Automatically color changing mode. Press the touch button to last color, then press it again, auto color changing mode works. 1 x 3D LED Night Light. Pattern: Tooth. 7 colors changed: red, green, blue, yellow, cyan, purple, white, all colors flash in turn. It has very rich colors of amber, green, an orangish-red and cream with glass jeweled accents on the shade. Highlighted by a Baroque motif. Shade contains hand-cut pieces of stained glass, each wrapped in fine copper foil. Tetris Stackable LED Lamp.. Condition is Used. Shipped with USPS Retail Ground. The Illumiglobe SKU 92438 - Desktop version. Shuts off automatically after six hours. Silver base. Requires three AA batteries. 7" sphere. (1 1/2 lbs.). We will select the best carrier for the item. LED lights in the aquarium base give off multi-colored glow. 1 x LED Aquarium. Enjoy owning your own beautiful aquarium without the hassle of cleaning and maintenance. Cell Phones & Accessories. Cell Phone Accessories. Mossy Oak Deer Antler Accent Table Lamp Camo Pattern! NEW! Free Shipping!. Shipped with USPS Priority Mail. Dale Tiffany Multi Color Stained Glass Post Office Lamp/Night Light. This colorful lamp is a rare find. I could not find anything else like it from the artist, a maker of fine art glass. The building measures about 5 3/4" tall x 4 1/2" wide x 3 1/2" deep. The base is 5 1/2" wide x 4 3/4" wide. Includes the bulb and metal insert (works great). Signed "C. Dale Tiffany, Inc" in metal scrawl on back (see photo). Condition is used, but appears to be very good. There are some minor imperfections and wear which make sense for it's age. Please look at the pictures. It looks to me like the lamp is complete but I could find no information or other photos to compare this to. 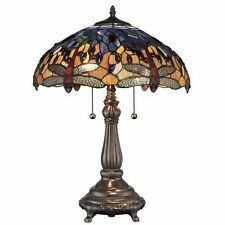 Really nice Tiffany Style Stain Glass Dragonfly Desk Table Bankers Lamp Art Deco Bronze Base. The base has dragonfly detail. 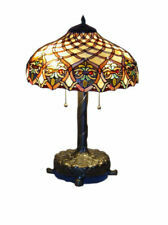 Tiffany-style Stained Glass Firefly Torchiere Lamp Shade. I LOVE the glass. Condition is used. 36" circumference shade. 17" circumference glass base. Tiffany Victorian Lamp: Double Lit Table Lamp ,Switch: Pull Chain, 2 60 watt E26 incandescent BULB, Different bulb can get different effect, Simple assembly. Made of high-grade glass (the color will not fade), copper foil, soldering tin, glass bead, copper wire etc., cutting, polishing and welding by hand. You can change the colors from your bed or chair with your remote and also use the touch sensor button on the stand with your finger. The stand also takes 3 AA batteries if you prefer to run it off the batteries.WOW, it lights up the room bright. Stained Glass Handcrafted Snail Night Light. Table Desk Lamp. Condition is Used. I will send you an invoice with combined, reduced. 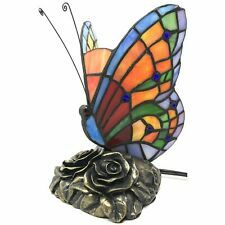 Perfect for end tables, night stands or kids' rooms, this colorful accent lamp features a butterfly-shaped shade made of Tiffany style glass. In-line switch. From Robert Louis Tiffany. With 81 pieces of hand-cut Tiffany-style glass; assembled using the copper foil technique. Tiffany style nightstand decor table lamp contains 156 pcs stained glass cut, 4pc Cabochons, Blackish bronze finish. UL listed, Beautiful Light Decoration for living room, bedroom, office, kids room, college dorm. This is a new plastic Tiffinay style desk/table lamp. I looked these over and found 2 small cracks that I have highlighted in pics. Overall very nice looking and in great shape. Thus this all Natural Himalayan Crystal Rock Salt Lamp makes the air clean, fresh and healthy to live in by improving your air quality. Note This crystals are machine and hand crafted. Emits negative ions into the atmosphere. Tiffany Style Glass Turtle Lamp. New in box - nevers taken out of box. Hand painted lighthouse with white round hardback shade and matching finial. Overall height of the lamp with shade is 31". Three-way switch. 100 watt maximum light bulb not included. Baseball Resin Lamp with Beige Linen Shade Multi color New. Baseball Resin Lamp with Beige Linen Shade. Boasting a base made of a glove shape and three baseballs, this adorable lamp is finished with a beige linen shade with red baseball-like stitching. Plug it in, and let there be light! Genuine Stained Glass Tiffany Lamp - 12" Height. Condition is New. Shipped with USPS Parcel Select Ground. One of a kind find! WONDERFUL RETRO KITCHEN LIGHT! There are many different interpretations of condition. I will not intentionally misrepresent any item. Stained Glass Peacock Table Lamp 9 1/2 X 10 X 9. Condition is Used. Shipped with USPS Priority Mail. Very Good Condition. No loose stained glass. No cracks. Uses a single bulb. Bottom of lamp is felt so it will not scratch your furniture. Has a switch on the cord to turn it off and on. Could use more cleaning, but gorgeous none the less. 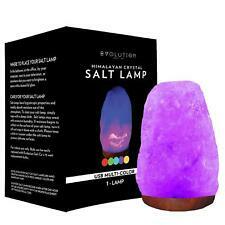 New ListingFineLife USB Rock Salt Lamp, Multi color LED changing - Ships Today! Salt lamp emits negative ions that help purify the air and dilute odors. Automatic multi-color changing LED light. USB Powered. Includes 55' USB cord. Baltimore, Maryland. Vintage Turtle Lamp Bronze & Glass Night Light Measures: 8" X 5-3/4" and 4" high. Very nice condition and works great. Adds a soft glow from a bookshelf, desk or bedside.Accepts your 25 watt, type B bulb. Cold Cast Polyresin With Felt Bottom. Use only Type A light bulb (not included), Max 40 watt. 4 1/2 ft. UL Approved electric cord with on/off switch. Decorative Table Lamp. We are the price leader of our industry. Multi Color Cylindrical Crystal Decor Natural Lamp 12x4"